Gauri Lowe is a medical doctor (University of Cape Town, South Africa) and spent several years after that working in rotations and then focusing in obstetric and gynaecology wards in government hospitals around Western Cape. Then she worked with a homebirth midwife in Cape Town and has been doing homebirths while in India too. Since the homebirth of her son during medical school her focus has become practicing and teaching a Sacred model of birth.She was a co-founder of the Complementary Medical Association at medical school; co-founder and speaker at the Midwifery and Birth Conference in Cape Town, South Africa and written articles for Midwifery Today as well as having an active blog page dedicated to spreading a Sacred model of birth. 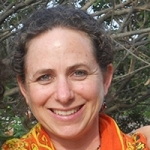 She is also studying botanical medicine for women’s health with Aviva Romm. Presently she does online holistic women's health and pregnancy consultations and is developing workshops to teach a Sacred Model of Birth to birth practitioners. A sacred model of birth – reality or fantasy? I have experienced birth as a medical doctor, a homebirth midwife and as a mother. My personal birthing experience changed my perspective and paradigm of birth as I realized the importance of this event in the lives of the mother as she begins her parenting journey and for the baby being born. So I began to research and engage with experts and other medical, midwife, birth workers, psychologists and mothers on this subject. I began to learn and realise that our experience of birth has the power to change the limbic imprint or the consciousness, what drives, what underlies a person and their expression in life, their “normal” – what molds their innate fears and character. The medical model of birth I was working in was grossly inefficient and depleted in reaching this aspect and appreciation of birth. The midwifery model is much closer yet still subordinate to the driving medical model. A Sacred Model of Birth is needed to truly address the underlying needs and happenings of the expression and founding experience physically and emotionally of BIRTH – for mother and birth worker. In this talk I explore what this means in various aspects and if it is a realistic option or just a fantasy.